This essay is inspired by the response given by one of our cancer survivors, when we asked him how best to support a girl in our care who had a cancer relapse and was now terminal. 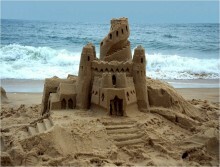 He said, “Just help her build her sand castle” …Wise words from a 17 year old teenager. Hospice Care is comfort care for the person dying with a critical or chronic illness. Palliative Care is comfort care for the person living with a critical or chronic illness. Picture life, like time spent on the sandy shore line of a beach. Our lifetime is spent building our personal sand castle. We are born with our backs to the ocean, knowing all the while it is there. We hear the sounds, and once in a while a wave actually comes up and chills our feet with a reminder, but we know the tide cycle and it is not expected in until a person is in their late 70s or even 80s. At least that is the word on the beach. Most of us are taught much of what we know about the beach by our parents, our religions, and our culture. These three influences tell us how to deal with sunburn, how to make a successful sand castle, and indeed define for us what a successful sand castle is. They teach us how to withstand the bullies on the beach and the rain, and still have time to enjoy the whole process. They cannot however, control the ocean. As children we spend most of our time learning from our parents the rules of the beach and how to make sand drizzle, motes and sturdy castle walls. Somewhere around the age of 15 or 16 (if not earlier) we don’t want the instruction and supervision, so we send our parents back to concentrate on their own castles. We want to try this skill ourselves. And yes we make mistakes, and yes, our castle may look completely different from the design plans we received from our parents, but that is half the fun! So we build, and drizzle, and design our sand castle, and it feels liberating to try things without our parents always knowing and correcting. Once in a while, we hear about a rogue wave that has taken away a beach neighbor unseasonably early. Their tide came off schedule. But that happens sometimes. Maybe the tide even takes away someone close to us. We get frightened, and think about looking over our shoulders at the ocean, wondering if this tide schedule can be trusted, but after all, we are young, and should have lots of time. Although none of us knows the exact time, we feel comfortable living with that uncertainty because we are young. From the time he can remember he is in and out of hospitals and told he is sick. Mom and Dad are very worried about the ocean. At some point he is told (or figures out?) that his wave will come in sooner than others on the beach; that he doesn’t have much time. While very young, he makes his sand castle with mom and dad and tries to ignore the ocean. The rogue waves that reach his toes, those random scares that happen, are just part of life for him. But as a teenager he wants to do what other teens are doing with their sand castles, but Mom and Dad are there to caution. Sometime during his adolescence he turns himself around to face the waves he cannot control, stops, and decides to live with it. Everyone else on the beach has their back to the ocean – so he feels alone and different, but he watches and waits and builds his sand castle with the best fortifications he can against the wave that he knows will come. He prefers to build with the ocean in his view. Some CF-ers choose to have it in their ears only, building their castle with abandon and a flick-off to fate. Every time she starts to build something cool, a little touch of water comes and melts it away – not the whole castle, but enough of it to keep from ever making progress. Nothing can stay put with the waves dribbling in so often. Why bother? The water just keeps interrupting the process. Mom and Dad encourage her, but they don’t know what it feels like. Some doctors think she is exaggerating about the water’s impact. Some school teachers say she’s not trying hard enough, or that she is lazy. Why can’t she keep up with the others? She should have a larger castle built by her age. Instead she is complaining of pain, waves of pain. She needs to keep up, but she can’t. As a teenager she starts to worry if she will have a family, a job, a college education. Is it really worth trying so hard when the water keeps coming and taking it away? Starting over… always starting over. Unlike the CF-er or Sickle Cell teen, everything has been going just fine for this teenager. He’s got big plans for his castle, and he is well on his way. High school is framed to set him up for a successful future. Relationships with girls are getting interesting and he is feeling like a young adult. He drives a car now, buys his own clothes and is starting to figure out his personal castle design. And then comes this wave – a rogue wave, big, and loud, and sudden – crashing down on his castle – turning it to sludge. Up until this point he’d hardly even been aware of the ocean behind him. He turns around now however, and looks it right in the face. Cancer. Old people get that, don’t they? But this rogue wave has made him very aware of the large glistening ocean that is both unpredictable, and a little frightening. He looks down the beach at all his friends building castles with their backs to the ocean. He will never feel quite the same about the castle he will rebuild, nor will he ever forget that the ocean is there, because he lives facing it – not so much in fear, but with understanding, and a greater appreciation for the life and time he has been given on the beach.